Fill your belly up in the morning with this delicious breakfast casserole. It is loaded with vegetables and has plenty of substitution options for the vegetarian, lactose intolerant, and health conscious individual. Instead of using milk, use almond milk and either reduce or leave off the cheese on top to cut down on the lactose. I used chicken sausage instead of regular sausage to make it a bit more lean, but there are many vegetarian sausage substitutes that could be used or just add an extra vegetable! Any oil type works in place of olive oil to cook the vegetables such as coconut oil. The full 12 eggs could also be replaced the equivalent in egg whites to be more heart healthy. Try different seasonings including red pepper flakes, oregano, or cumin. The vegetables are completely interchangeable and can easily be swapped out for your favorites. I added some broccoli and green onions based off a suggestion and it was delicious! 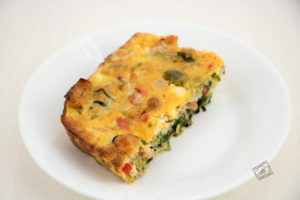 Spray a 7×11 or 9×13 casserole dish depending on how many vegetables you are adding with non-stick spray. Set aside. In a large skillet over medium heat, brown the sausage. If you are using fully cooked sausage, you may skip this step but a little heat and browning makes all the flavors come out that much more. Spoon the browned sausage evenly into prepared casserole dish. Set aside. Add a little olive oil to the same large skillet (about 2 teaspoons since there is some grease left from the sausage). Sauté the garlic, spinach, peppers, and onion until vegetables are tender and spinach is wilted, about 6-7 minutes. Season with salt and pepper during the last minute or so. Add the cooked vegetable mixture to the sausage in the prepared casserole dish and roughly stir together to distribute mixture evenly. Set aside. In a medium size bowl, whisk together the eggs and milk. 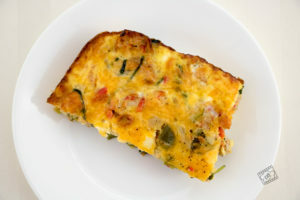 Pour egg mixture evenly over sausage and vegetable mixture. Sprinkle with shredded cheese and a little more salt and pepper. Cover casserole dish with plastic wrap or foil and refrigerate at least 2 hours or up to 1 day. When you are ready to bake the casserole: preheat the oven to 375ºF and bake for approximately 45 minutes or until edges start to brown. Allow to cool at least 15 minutes before serving. Store leftovers in the refrigerator up to 5 days. Reheat individual servings in the microwave as needed. 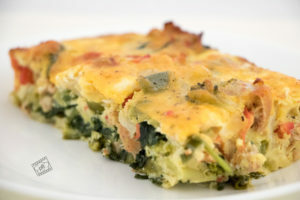 Baked casserole may be frozen, up to 2 months. Thaw in refrigerator overnight and bake at 350ºF for about 20 minutes or until heated through. 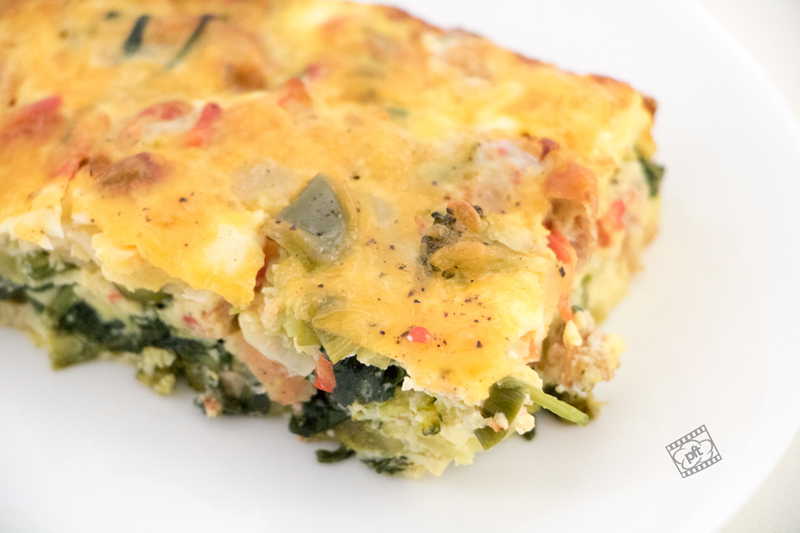 To make ahead/freeze this casserole: you can freeze unbaked casserole up to 2 months. Cover very tightly with plastic wrap and foil. Thaw overnight in the refrigerator and continue with step 5.